As a member of Cambridge Wireless, Bango were invited to submit a proposal outlining how our technology could be deployed by Costa Coffee for the “coffee shop of the future”. Over 50 submissions by local, national and international companies were considered by a selection committee. 10 (actually 13) finalists were chosen to present in Cambridge to Senior Executives from Costa Coffee and a judging panel that included representatives from Google, Amazon, Intel and the Cambridge Judge Business School. Bango was part of the final 13; the other finalists were from Action.ai, Climate Edge, Conigital, GeoSpock, interests.me, MakersCafe, Misha Pay, Novalia, Pavegen, Tenzo, TrueAI and Zapper. The remit for the day was to take a written pitch that had been submitted for consideration and build on the idea, by working with mentors from a number of consultancy companies, brought in by Costa (for example Fujitsu, Intel, Cambridge Design Partnership, plus a whole load of experts from Costa). Other people were on hand, for example cost and analysis experts and a great illustrator to make ideas come to life. The event started with Costa giving an overview of their operation and technological vision for the future. There were three main themes/ focus areas; “people, coffee and progress”, with sub-areas with creative names like “health and well-being” and “maximizing time”. After the overview and objective setting, each team was allocated an office, with whiteboard, screen and other audio-visual aids and invited to develop their pitches for the next three hours. After lunch, the mentors and Costa staff helped the finalists to refine and practice their pitches, before presenting to the judging team in a 5-minutes (yes, just 5-minute!) session, in the theatre. Bango’s proposition for Costa’s store of the future is all about maximizing Costa’s time and that of their customers, with a focus on people, progress and coffee (the Costa corporate buzz words). Cash is a thing of the past; however, credit card penetration is low in many of Costa’s new target markets such as Malaysia. 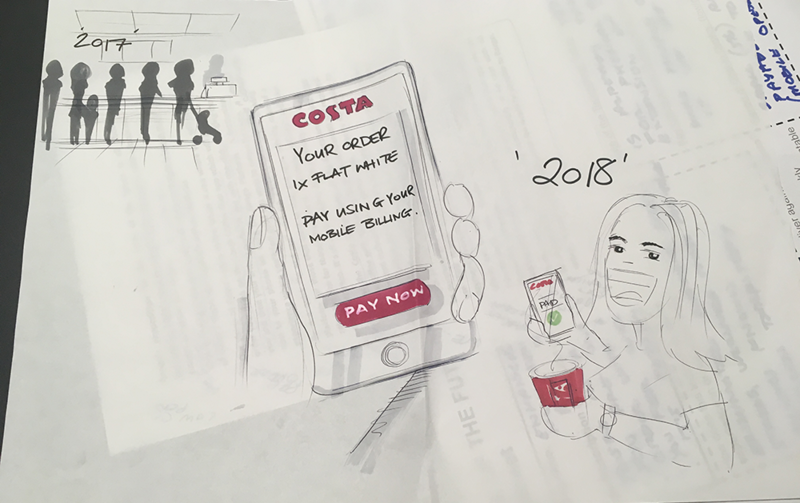 Bango’s vision of Costa’s store of the future is one where you will pre-order your drink on the Costa Coffee Club app, it’ll geolocate you and time your arrival perfectly, you pay with one-click, charging the cost to your phone bill using the Bango Platform. A frictionless experience where you’ll feel good (the health and wellness bit!) and want to return for more. Be it a quick “in and out” visit or a longer stay with a barista viewing platform for those that want to stop and chat, offering more of a retail theatre. The choice is Costa’s and your customer’s too. It’s all about insight and digital efficiency. Arrive at the Costa Coffee shop of the future and enjoy your favorite coffee with no queues, no cash and no credit card required. Simplicity and inclusivity on a global scale. There’s no queuing to order, pay or collect. Bango provides a payment platform to the world’s leading digital brands such as Amazon, Google and Microsoft, allowing consumers to purchase goods, content and services (digital and physical) and use their mobile operator phone bill (pre or post paid) as the method of payment. Everyone has a mobile! Offers can be highly personalized and targeted to the user and incorporated into loyalty programs, promotions and other marketing campaigns. It’s about being known (if the consumer desires) and making relevant offerings in their personal territory. It’s the obvious future extension to Costa’s Coffee Club app and can be implemented and delivered immediately. Our pitch was well-received, however it wasn’t an earth-shattering idea that would rock the boat of the PR world and make front page news in “Coffee Today”, so we didn’t win the final. The three chosen companies from the final 13 were Conigital, MakersCafe and PaveGen. The event was extremely well organised, the participants, judges and mentors were all thoroughly interesting and engaging and it was a pleasure to be invited to participate and make the final. The coffee was OK too! This entry was posted in carrier billing, cool mobile stuff, digital content, Mobile commerce, Mobile payments and tagged mobile billing, mobile commerce, mobile payment, mobile payments. Bookmark the permalink.